Again, I would like to thank the folks who have donated to WARN's fundraising drive. There were some very kind donations yesterday which I certainly appreciate. Again, we are getting close to the goal I have set for the fundraiser. If you can and are able, do throw some pennies into the donation pile if you like and support my work here on WARN and elsewhere. The 70th annual D-Day memorial weekend continues. Of course, there is an obligatory History Channel special on the invasion that is exceptionally well-produced and worth watching. Human interest stories about an 89 year old D-Day veteran returning via parachute to France, escaping from nursing homes to make a pilgrimage to the battle site, showing some beautiful young women that the "Yanks are indeed still here", and thanking Obama for keeping the United States out of war in Syria, are requirements for those who of us want to participate in this ritual of public memory. Here, I suggested that the American people should never forget how the "Greatest Generation" were not all white and male and from the United States. Moreover, the soldiers who landed on D-Day included African-Americans, a group whose presence in the battle, until recently, had been whitewashed out of history. There were other unsung warriors in the D-Day invasion as well, the exploits of which in World War 2 (and other conflicts) should be recognized and acknowledged with the thanks and honor they deserve. I was reading the great Charles Pierce. He writes for Esquire. In 4 paragraphs Pierce can offer more insight and clarity on political and social issues than most other essayists and commentators could accomplish with 30 pages. Pierce is now operating at the height of his powers: while reading his great take down of Republican hypocrisy and their "America fk Yeah!" militarism about Obama's foreign policy and the Bergdahl release, I noticed his reference to Ernie Pyle. Pyle was America's greatest war correspondent. He was also one of the country's most talented writers. Pyle practiced his craft from the front lines. He was the soldier's friend and advocate. NORMANDY BEACHHEAD, June 17, 1944 – In the preceding column we told about the D-day wreckage among our machines of war that were expended in taking one of the Normandy beaches. Here in a jumbled row for mile on mile are soldiers’ packs. Here are socks and shoe polish, sewing kits, diaries, Bibles and hand grenades. Here are the latest letters from home, with the address on each one neatly razored out – one of the security precautions enforced before the boys embarked. Who else was on that battlefield? Do you have a tear in your eye? I do. How many of those dogs were cut loose by their handlers when the latter realized that all hope was lost and their animal comrades deserved a chance to live? How many of those canine soldiers either refused or could not leave their human partners, and subsequently were killed by drowning, fire, explosions, or bullets? What were those dog soldiers, loose, confused, now running around the battlefield, looking for their humans, thinking? Did they know that their human friend was dead and gone? Men choose, in their own way, to go to war. Our doggie friends have no such choice. During World War 2, dogs served as scouts, as sentries, searched for explosives, both guarded and infiltrated bunkers, and were even equipped with parachutes so that they could join airborne troops on D-Day and in other battles. I shudder at the thought of what the Russians had planned--dogs with mines on their backs who would run under tanks in a kamikaze mission made possible by their love and loyalty to people, the same people who were going to kill them. I have had several dogs in my 30 or so years on terrestrial Earth. Several of them were just too smart to allow themselves to be sent to war. One was a gentleman scholar. War would have been too dirty and upsetting for sensibilities. One dog was a princess. She would have faked illness or sickness to avoid being forced into service. But her brother Luke? He was a hero. A fighter. Luke would have survived a hurricane by floating on a garbage can or scurrying up to a roof. If a zombie outbreak laid waste to human civilization Luke would have hidden, eventually founding a kingdom that he would rule, benevolently yet with a firm hand, as a king. Luke was tolerant of cats. They would have made for a good vizier or adviser. I can see Luke, sitting on his thrown, with a white cat whispering intrigues into his ear, all the while Luke laughing. His sister would have manipulated him--or so she thought--but Luke was fiercely protective of her and would have indulged Leia's machinations for the sake of protecting her ego and pride. Even as his muzzle became more and more gray, his nails so long that they scuffed and marked the linoleum floor--he napped or stood sentry on it, especially in the summer under the air conditioner, sitting by my mother while she ate or watched TV--and the arthritis made it harder for him to negotiate the stairs, Luke remained a tough old man in the form of a dog. As he aged, developed a touch of the senility, and turned 17, I could almost imagine him being reincarnated as a character from a Sam Peckinpah film or as Quint from Jaws. Perhaps he already was? Is? Will be? Who knows? I am a simple man who does not have knowledge of such complex matters. 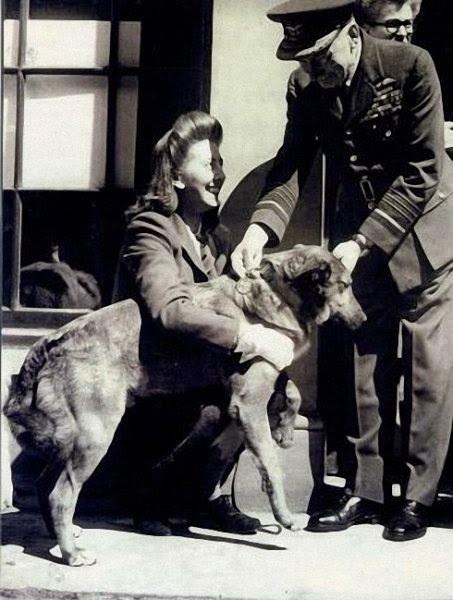 On this weekend, the 70th anniversary of the D-Day invasion, please remember our canine soldiers. They served bravely on that day--and continue to do so in all of the far off corners of America's Empire. If you have a canine friend, please do give him or her a kiss and a treat as a proxy for thanking the war dogs of D-Day and World War 2.